Give the student the knowledge and skills to effectively and safely operate a digger derrick. Give the student the knowledge and skills to successfully pass the Digger Derrick written and practical exams administered by the National Commission for the Certification of Crane Operators (NCCCO). Give the student the knowledge and skills needed to become employed as a digger derrick operator. TERMS AND DEFINITIONS: Student will learn the different terms and definitions that apply to digger derrick safety and operation. 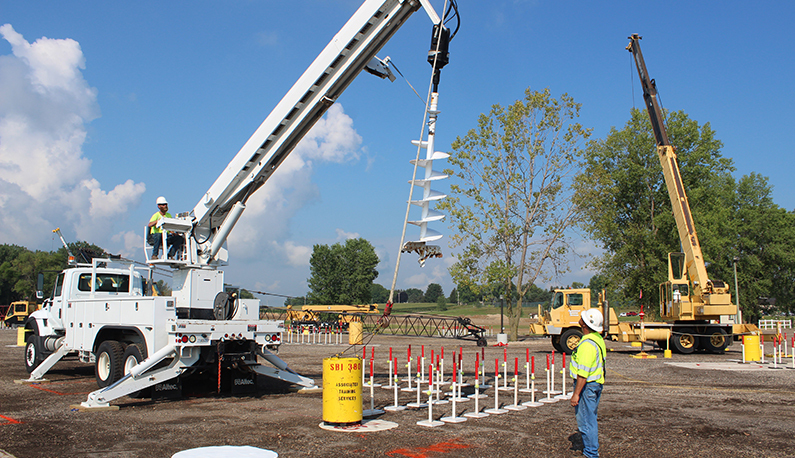 EQUIPMENT COMPONENTS: Student will learn the different components that apply to digger derrick safety and operation. PRE-OPERATIONAL INSPECTION: Student will learn the process for a pre-operational inspection of a digger derrick. SITE PREPARATION: Student will learn the process of preparing a site for digger derrick operation. MACHINE SET UP: Student will learn the process of setting up a digger derrick to begin operation. LIFTING LOADS / LOAD CHARTS: Student will learn the process of reading load charts for a digger derrick and process of lifting a load with a digger derrick. UN-STOWING/STOWING AUGER: Student will learn process of un-stowing and stowing the digger derrick auger. DIGGING OPERATIONS: Student will learn the process of digging a utility pole hole with the digger derrick auger. POLE SETTING: Student will learn the process of setting a utility pole with a digger derrick. UNDERGROUND HAZARDS: Student will learn the different underground hazards when digging with a digger derrick and what the procedures are for determining their locations. REMOTE POWER TOOLS: Student will learn the different power tools that are used with digger derricks. POLE PULLER: Student will learn the process for pulling a pole with a digger derrick. PERSONNEL PLATFORMS: Student will learn the process for using a personnel platform with a digger derrick. OVERHEAD UTILITY HAZARDS: Student will learn the different overhead utility hazards when operating a digger derrick and what the procedures are for working around them. STOWAGE & TRANSPORT: Student will learn the process for stowing the digger derrick components and tools and transporting the digger derrick.